In London these days, you can’t help but run into one of celebrity-chef Jamie Oliver’s many shiny new restaurants. 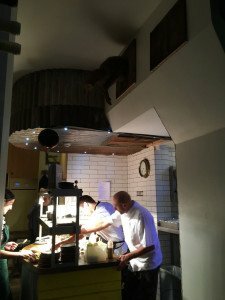 These outposts of casual upscale dining are both billboard and beachhead for Oliver’s so-called food revolution–a movement that’s built on the work of many before him but that’s brought the issues of healthier eating and local organic farming into sharp focus across London and around the world. 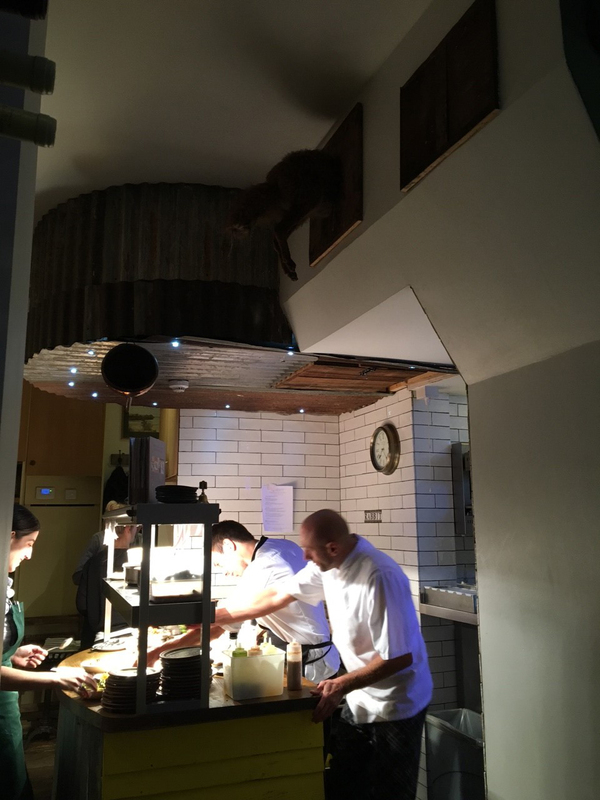 And there’s no better proof that this mission to marry healthy ingredients with innovative flavor is finding firm and fertile footing in the UK than at the farm-to-table powerhouse, Rabbit in London’s Chelsea neighborhood. 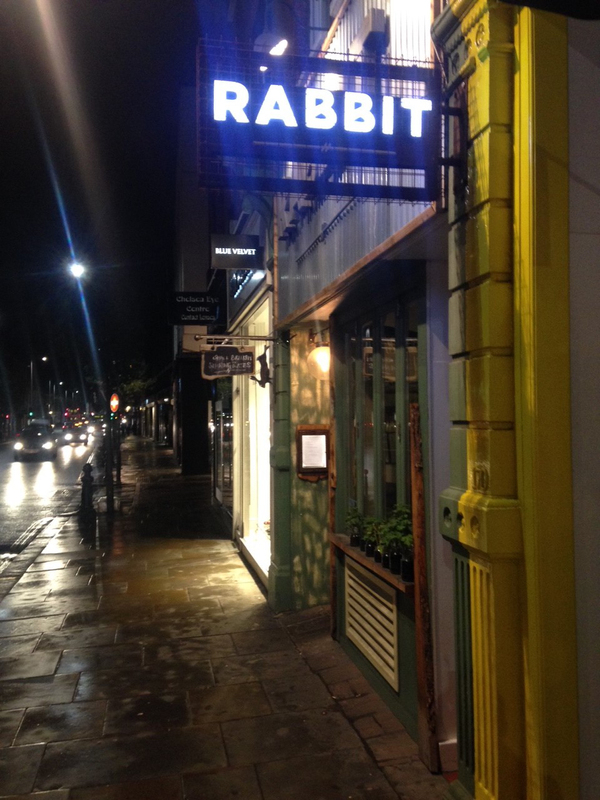 The second restaurant from the Gladwin brothers (who also opened the similarly themed The Shed in 2012 in London’s Notting Hill), Rabbit has earned rave reviews and an enviable reputation for preparing and presenting rustic English fare in entirely original and unexpected ways–all in the heart of urbane London. The secret behind the success: Nutbourne farm and vineyard in West Sussex. Besides providing seasonal produce and meat for the Gladwin brothers’ restaurants, Nutbourne was where they were raised. 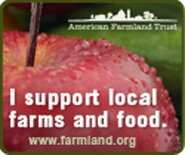 Growing up on the farm clearly gave them an appreciation for the rich palette of seasonal flavors (both domesticated and wild) that now serve as the foundation of many of the dishes found in both restaurants–not to mention an approach to cooking that encourages the sustainable and creative maximization of whatever’s on hand. With the eldest brother Oliver as the head chef, Richard the business manager, and the youngest brother Gregory the farm manager, Rabbit’s cuisine is the product of a loose and cooperative division of labor that lets each brother focus on their area of expertise while allowing inspiration for finding new ways to express the flavors of the English countryside on Rabbit’s constantly changing menu to come from anywhere: a sudden garden bounty, a kitchen discovery, a farmers market foray, a lucky wild foraging find, a hunting trip, a conversation with a fellow chef, or perhaps even an idea from a customer. This openness and genuine affection for making and sharing great food fills the air at Rabbit. Despite its location on King’s Road in affluent Chelsea, the restaurant’s interior is rustic, intimate, and approachable–with friendly servers never far from hand in the homey open dining room adorned with playful features like antlers, tractor seats, and benches made of wood from trees downed at Nutbourne. The effect is a space that’s tight but cozy and comfortable, which is important because every dish at Rabbit is designed to knock you over. At the top of the menu is the only listed beverage: the daily loosener, which on my visit was the Apple Bite cocktail. Served in a kitschy boot-shaped glass and made from gin, apple, vanilla, star anise and soda, the concoction was refreshing in every way, appropriately loosening me up after hours of traipsing around the city and sufficiently opening my mind with intriguing hints of exotic flavors to get me primed for the parade of delights that was to come. 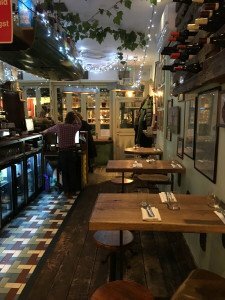 The dishes at Rabbit veer towards the small-plate, tapas size but lest you think you’d starve after a meal there, I can assure you such a fear is unfounded. Every dish is packed with hearty flavors and a richness borne of quality ingredients, ingenious flavor pairings, and creative presentations with colors, textures, and topography to rival the Grand Canyon. Appetizers here are called mouthfuls and, while naturally smaller, they are no less decadent and complex than the mains (divided at Rabbit into slow cooking and fast cooking groups). I chose to start with three of these intriguing mouthfuls: a beetroot crisp, a cod rillette, and rabbit confit (which I was excited to hear was made from a rabbit raised at Nutbourne). The beetroot crisp was a foamy little dream of a thing tucked into a cloud of whipped goat cheese and quince jam that passed by my taste buds like a summer breeze. 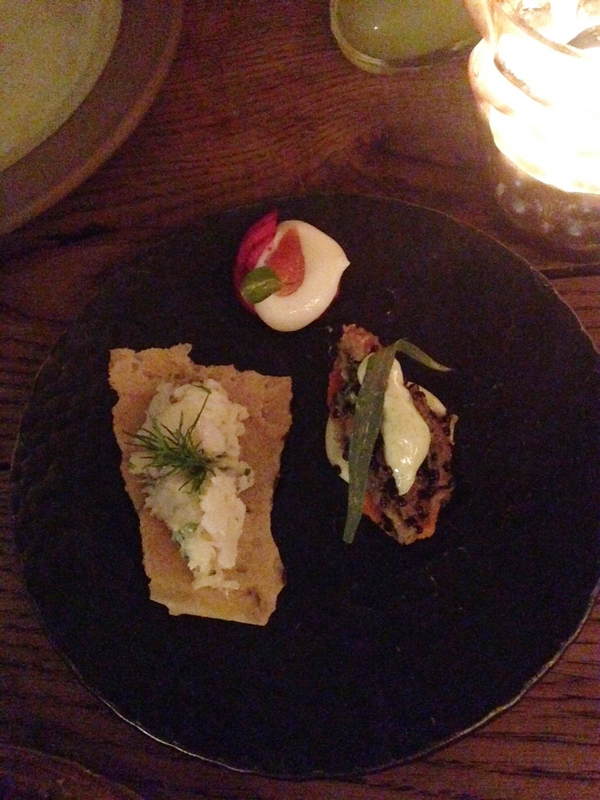 More substantial but no less ephemeral was the cod rillette, served cold and chopped with lemon on a caraway crisp. Its mild fishiness was offset with the bright lemon, a sprig of dill, and some kind of light cream that bound it all together just long enough to get into my mouth before dissolving into nothing but memory. Bringing this warm-up round to a close was a morsel of moist rabbit confit filled with savory poppy seeds (that must have been pickled–because they popped like caviar when chewed) and served with the lingering kiss of a tarragon sprig. I barely had time to savor this playful and artfully textural amuse-bouche before I was presented with what would be one of the best parts of the night. Cures (for cured meats and veggies) occupy a whole section of the Rabbit menu and the first one I was served, the gin-cured trout, showed why. Served with pickled carrots, horseradish curd, and rapeseeds that deftly cut through the fat and salty trout flavors, this fish was a jaw-dropping revelation. The meat was pink, moist, thick: redolent of both Scandinavian and Japanese cooking and altogether satisfying in an almost primal way. The dish paired extremely well with the crisp house white wine (made at Nutbourne). Not ordering more required extreme self restraint. My second cure was a finely ground chorizo (pork sausage) served with labneh (yogurt cheese) and crispy sautéed kale, which I eagerly devoured on the thin crisps that were presented stuck into the dish in mohawk-like ridges. The chorizo was far less greasy than I’ve found to be typical and ground so fine as to blend seamlessly with the light labneh. It was a rich dish that could easily have been too heavy but wasn’t. The extra time it took to dole out and consume the chorizo offered a needed pause in a meal that was quickly gaining a dizzying momentum. It was becoming apparent that there was constant communication between the floor staff and kitchen because, again, almost as soon as the last bit of chorizo was swallowed, the first of my fast cooked plates arrived: a fried paprika cuttlefish served with black bean paste, almonds, sweet chili sauce, and topped with red-vein sorrel microgreens. While I was impressed with the commitment to timing, the dish wasn’t my favorite. The cuttlefish was lightly breaded, and the bean paste was a nice, if a bit overpowered, complement to the lightly fried fish but the very simple and strong sweet chili sauce sent the whole dish careening straight into a fairly routine Asian flavor territory. It struck a slightly off-key note for a meal filled with otherwise unique flavor combinations. The second fast cooking plate didn’t look as interesting in the mound of radicchio it came with, but hiding within it was one of the most amazing liver dishes I’ve ever had. This one was duck liver and it was served with a curious smattering of golden grapes, chives, and crisp, crunchy radicchio that provided a solid and earthy complement to the liver that was tender, fatty, and free of the sometimes acrid flavor one associates with poorly prepared versions. At this point, I was feeling pretty satisfied with things. Little did I know but the best was yet to come. 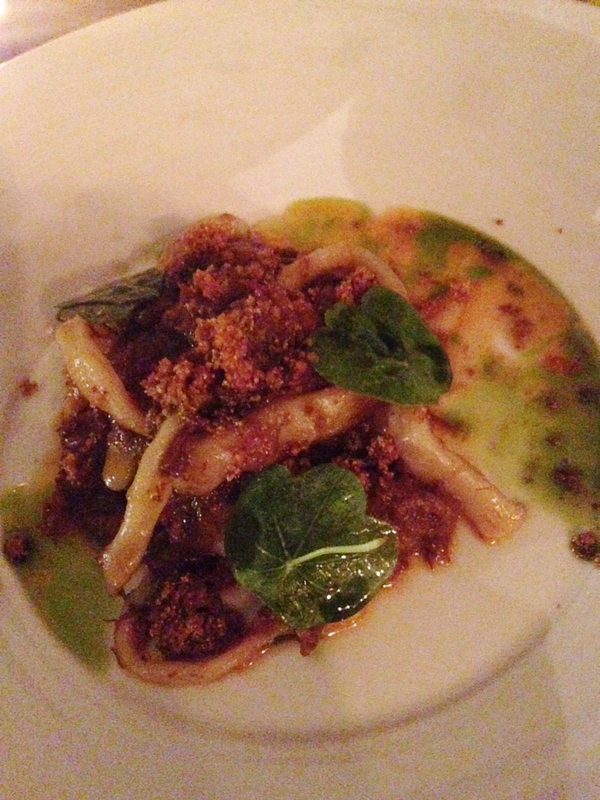 The slow-cooked braised venison blade served with pici pasta (similar to fat spaghetti), tarragon, and sourdough bread crumbs was an absolute marvel. Stewed in some kind of simple tomato and broth base with an infused herbal oil, the meat was gelatinous and shredded like you’d expect from a game animal like wild boar, but with a hearty richness and a savory sweetness that elevated it leagues beyond typical venison, oxtail, or even southern pork BBQ (its closest analogues). So profound was the satisfaction the dish commanded that I could scarcely utter a coherent word until this mighty main course was no more. Upon inquiry, it turned out that the venison was wild and had actually been harvested by Gregory at Nutbourne for the unpardonable crime of eating his crops. So, not only was the meat local, fresh, and hand-butchered, but, up until quite recently, it had been eating a diet of some of England’s most valuable organic produce. No wonder it was so good. What’s more, it was garnished with wild-foraged nasturtium greens the brothers had recently brought in from some wild corner of Sussex. The dish was a true taste of the land and provided a great example of a Gladwin cooking maxim: what grows together goes together. After this decadence, there was simply no room for dessert beyond a dip into the calm, lapping waters of a sweet Sauterne to help ease me back to my normal reality from this too-brief glimpse of the playful decadence possible in a rural English kitchen. In my experience, I’ve never come across a better example than Rabbit of how farm-to-table food can work in the service of elegant and adventurous fine-dining, and I must say I was a bit surprised. The hoary cliché still common in the U.S., that British cuisine is bland at best with simple dishes like Shepherd’s Pie and Bangers and Mash, is in need of a complete overhaul. Rabbit is a sure sign that farm-to-table has arrived in London and that there’s no shortage of ideas and flavors on the Isles to be explored in creative and delicious ways. The Gladwins (named young entrepreneurs of the week by Huffington Post UK) show that when approached with a commitment to freshness and originality, eating local can be an exquisite joy. The brothers’ highly praised The Shed: The Cookbook may provide a way for distant Americans to savor their inspirational cuisine.